The Nissan Maxima has been selling in the UAE for quite some time now. So, Nissan thought to give this car an update. Revealed at the 2018 New York Auto Show, the 2019 Nissan Maxima follows Nissan’s Vmotion 2.0 design language. It’s going to be longer, wider, and lower than the current model. We would be getting to experience new engine options as well - 2.5-litre and 2.0-litre turbocharged. There would be an AWD model as well. The current model is powered by a 3.5L V6 engine that produces 300 horsepower and 354 Nm of torque. The transmission is CVT. There are four variants available for purchase - S, SV, SR, and Midnight Edition. There are 7 color options - Dark Blue, Black, Pearl White, Brilliant Silver, Metallic Slate, Pearl Blue, and Carnelian Red. The starting price of the Nissan Maxima is AED 102,900. The Maxima fights against the Honda Accord and the BMW 3-series sedan. Have a question on Maxima? Watch latest video reviews of Nissan Maxima to know about its interiors, exteriors, performance, mileage and more. Suiting the name in its best way, the Nissan Maxima serves as the flagship sedan from the renowned Japanese manufacturer. With flamboyant looks and premium interior feel, the Nissan Maxima is one perfect balance between being sporty and elegant at the same time. The Maxima in the UAE is available with only one powertrain, three different variants – S, SV and SR, six upholstery options, and seven color options – Pearl White, Brilliant Silver, Metallic Slate, Black, Dark Blue, Pearl Blue, and Carnelian Red. Just like on the outside, the interior cabin of the Maxima maintains a perfect balance between sophistication and sportiness with the driver-focused cabin executed with finely crafted elements. One does get the option of six different upholstery options to choose from – Cashmere Cloth, Cashmere Leather, Camel Leather, Charcoal Cloth, Charcoal Cloth and Charcoal Leather with Alcantara inserts. The steering wheel gets a unique V-shaped theme which gives it a good-to-hold feel, which only gets complemented with the brilliant visual appeal of the instrument console behind it. The dark wood finish and leather upholstery enhance the premium appeal of the interior cabin. The central console gets a hexagonal finish and is dominated by the presence of an 8-inch touchscreen infotainment system with all the modern day amenities on display. The brushed aluminium finish around the gear lever and drive mode selector knob is a nice touch too. In terms of space, the Nissan Maxima has comfortable seating room for five full-sized adults, however, at 403 litres, the boot space has been compromised a bit. And when it comes to features, the Maxima is fully equipped with a modern kit like powered front seats, panoramic sunroof, leather upholstery, premium BOSE music system with 11 speakers, memory function for driver’s seat, rearview mirrors, tilt and telescopic steering column and many more. Nissan designers should be appreciated for the way the Maxima has been crafted. 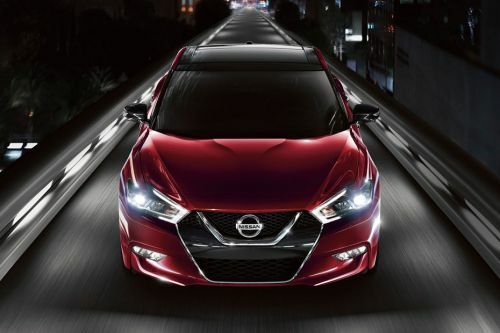 Going by the exterior looks of the Maxima, the flagship Nissan sedan hits the perfect middle-ground between being outright sporty and sophisticated elegance. At the front, the Nissan Maxima comes with boomerang shaped headlamps with projector units and daytime running LEDs, which are in line with other Nissan cars. So, is the V-shaped chrome grille, which sits at the upper centre of the large hexagonal grille, thus giving the frontal view some visual mass. From the sides, the Nissan Maxima looks beautiful and distinctive, thanks to the swooping curve which flows right from the front headlamp to the rear door. The sloping roofline and blackened C-pillar gives an impression of a floating roofline, which is rarely seen on sedans of this class, thus making it look very sporty. At the rear too, the Maxima comes with the same boomerang and LED effects on tail lamps as seen on the front headlamps, with dual ports for exhaust rounding off the aggressive stance. Given its sporty essence, the overall ride quality of the Nissan Maxima isn’t as supremely plush as one would have expected. However, the suspension has been fine-tuned for making the overall ride smooth to not make it feel uncomfortable. The driving dynamics of the Nissan Maxima is a one-up from similarly priced sedans, given its sporty steering and suspension setup. On the powertrain front, the Nissan Maxima has got a 3.5-litre V6 petrol engine under its hood, which is good enough to produce a maximum power output of 300 PS and a peak torque output of 354 Nm. The engine is mated to a 7-speed CVT gearbox with paddle shifters for spirited power delivery as and when required. The Nissan Maxima is equipped with some of the best safety features available in the auto industry. The safety features include ABS with EBD and Brake Assist, forward emergency braking, traction control, vehicle stability control, front, side and curtain airbags, active ride control, active trace control, active engine brake, intelligent driver alertness, intelligent around view monitor with moving object detection, intelligent emergency braking, intelligent forward collision warning, blind spot warning and lane departure warning. For those who want a perfect balance between sporty driving pleasure and sophisticated appeal, the Nissan Maxima makes a great case for itself. The Maxima, with its impressive styling, nicely crafted interiors and proven mechanicals, is a good alternative for all the premium German sedans available in the market. What is the price of Nissan Maxima? On road prices of Nissan Maxima in starts from AED102,900 for base variant 3.5L V6 S, while the top spec variant 3.5L V6 SR Midnight Edition costs at AED139,913 .